I tried changing the authorizationUrl adding the parameters approval_prompt=force and access_type=offline but it didn't work too. How can I get the refresh_token using Xamarin.Auth? @dankern did you solve the problem ? I have the same problem me too. I solved the problem using a WebView and requesting the information as a website. I couldn't find any other way. If you want I can send you some code. I have the same issue. Is that offer with some code examples still available? I plan to use Xamarin.Auth in my application as well. 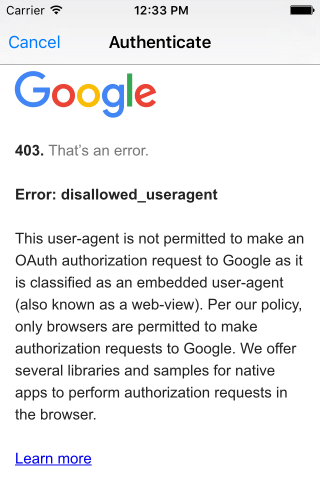 Is this a problem just when trying to reauthorize with the Googles? Or is this something that is an issue with using Xamarin.Auth? If so, what did you do for the work around? Can you provide a sample snippet? @dankern do you like to share your code? hi i am facing problem in authenticating my google account in Xamarin.iOS using xamarin.Auth ,getting the error as shown in screen shot.can somebody help me? Use OAuth2Authenticator's extension method RequestRefreshTokenAsync from Xamarin.Auth.Extensions nuget package to exchange refresh token for a new access token. When using this extension method, I'm not seeing OnAuthenticatorCompleted called afterwards (or during) the call. I am getting a valid 'expires_in' time back of 3600 (from Google). Is there any other way to get back the new access token, without receiving the completed event? OnAuthenticatorCompleted is not triggered when you reuse the OAuth2Authenticator. Create a new OAuth2Authenticator to call the RequestRefreshTokenAsync method. Hello; did this solution is working.. I still have the same problem! after 3600sec my access_token is invalid; I have the refresh_token; but I do not know how to get a new access_token from the refresh_token? thank a lot; I used Your solution and.... it worked for me!